Christian Nyby was an American television and film director and editor. As an editor, he had seventeen feature film credits from 1943 to 1952, including The Big Sleep (1946) and Red River (1948). From 1953–1975 he was a prolific director of episodes in many television series, including Gunsmoke and Wagon Train. As a feature film director, he is likely best known for The Thing from Another World (1951). A flying saucer is a descriptive term for a supposed type of flying craft having a disc or saucer-shaped body, commonly used generically to refer to an anomalous flying object. The term was coined in 1930 but has generally been supplanted since 1952 by the United States Air Force term unidentified flying objects or UFOs. 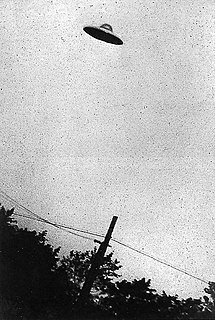 Early reported sightings of unknown "flying saucers" usually described them as silver or metallic, sometimes reported as covered with navigation lights or surrounded with a glowing light, hovering or moving rapidly, either alone or in tight formations with other similar craft, and exhibiting high maneuverability. In Anchorage, journalist Ned Scott (Douglas Spencer) looks for a story. He visits the officer's club of a local military station and meets Captain Pat Hendry (Kenneth Tobey), a pilot, Lieutenant Eddie Dykes, co-pilot and friend of Scott's, and Ken "Mac" MacPherson, navigator. Station chief General Fogarty orders Hendry to fly to Polar Expedition Six at the North Pole per the request of its lead scientist Dr. Arthur Carrington (Robert Cornthwaite), who reports that an unusual aircraft has crashed nearby. With crew chief Bob, Corporal Barnes and a pack of sled dogs, the group fly to the outpost the next morning in their Douglas C-47, the Tropical Tilly. 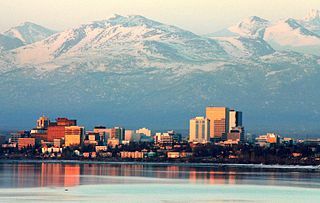 Anchorage is a unified home rule municipality in the U.S. state of Alaska. With an estimated 298,192 residents in 2016, it is Alaska's most populous city and contains more than 40 percent of the state's total population; among the 50 states, only New York has a higher percentage of residents who live in its most populous city. All together, the Anchorage metropolitan area, which combines Anchorage with the neighboring Matanuska-Susitna Borough, had a population of 401,635 in 2016, which accounts for more than half of the state's population. At 1,706 square miles of land area, the city is the fourth largest city by land in the United States and larger than the smallest state, Rhode Island, at 1,212 square miles. Douglas Spencer was an American film actor. Starting in the mid-1930s and going through the 1940s, he appeared in dozens of films as an extra, then cameo roles and uncredited roles. An officers' club, known within the military as an O club is similar to a gentlemen's club for commissioned officers of the armed forces. Few officers' clubs have survived the end of the Cold War. Upon arrival, Scott and the airmen meet the camp: radio operator Tex, Mrs. Chapman, Lee, one of two cooks, and Inuit dog handlers. Also present are several scientists: Vorhees, Stern, Redding, Stone, Laurence, Wilson, Ambrose, Auerbach, Olson, Mrs. Chapman's husband Dr. Chapman, and Carrington, a Nobel laureate. Hendry rekindles a romantic interest with Nikki Nicholson (Margaret Sheridan), Carrington's secretary. Several team members fly to the crash site, finding an object buried beneath ice. As they spread out to determine its shape, they realize they are standing in a circle—they have discovered a flying saucer. The team attempt to unbury the craft using thermite explosives, destroying it. However, their Geiger counter detects a frozen body buried nearby, which is excavated in a block of ice. Returning with the ice block as a storm moves in, Hendry assumes command. He denies Scott permission to send a story, and denies the scientists' demands to examine the specimen. Tex sends an update to Fogarty, and the airmen settle in. A watch is posted; Barnes relieves McPherson and, disturbed by the creature's appearance, covers it with an electric blanket which he does not realize is plugged in. The block thaws and the creature escapes, killing two dogs. The airmen recover the creature's severed arm. The Inuit are a group of culturally similar indigenous peoples inhabiting the Arctic regions of Greenland, Canada, and Alaska. The Inuit languages are part of the Eskimo–Aleut family. Inuit Sign Language is a critically endangered language isolate used in Nunavut. Margaret Elizabeth Sheridan was an American actress of the early 1950s, and protégée of director Howard Hawks. She is best remembered for her role as Nikki Nickolson opposite Kenneth Tobey in the 1951 science fiction classic The Thing from Another World. Thermite is a pyrotechnic composition of metal powder, which serves as fuel, and metal oxide. When ignited by heat, thermite undergoes an exothermic reduction-oxidation (redox) reaction. Most varieties are not explosive, but can create brief bursts of heat and high temperature in a small area. Its form of action is similar to that of other fuel-oxidizer mixtures, such as black powder. That evening, the scientists examine the arm, concluding that the alien is an advanced form of plant life. Carrington is convinced of the alien's superiority to humans, and becomes intent on communicating with it. The airmen begin a search, which leads to the camp's greenhouse. As the search moves on, Carrington stays behind with Vorhees, Stern and Laurence, having noticed evidence of activity. They discover a third dead dog, which has had its blood drained—the creature feeds on animal blood. Carrington and the scientists post a secret watch of their own, hoping to encounter the creature before the airmen find it. The next morning, the airmen continue their search. Tex informs them that Fogarty is aware of their discovery and demands further information, prevented by the storm. Stern appears, badly injured, and tells the group that the creature has killed Auerbach and Olson. When the airmen investigate, the creature attacks them; they manage to barricade it inside the greenhouse. Hendry confronts Carrington and orders him to remain in his lab and quarters. Carrington becomes obsessed with the alien. In the lab, he shows Nicholson and the other scientists an experiment: using seeds taken from the severed arm, he has grown plants by feeding them blood plasma from the station's reserves. Hendry finds the plasma missing when it is needed to treat Stern, leading him to confront Nicholson, whose notes lead back to Carrington. Fogarty sends orders to keep the alien alive, but it escapes from the greenhouse and attacks the airmen in their quarters. They douse it in kerosene, burning it and forcing its retreat. As soon as the camp regroups, they realize that the temperature is falling rapidly—the furnaces have stopped working, sabotaged by the creature. The team retreat to the station's generator room to keep warm, and an electrical "fly trap" is rigged. The alien attacks again, but at the last moment, Carrington emerges and pleads desperately with it, attempting communication. It knocks him aside, walks into the trap, and is electrocuted until it is reduced to ashes. Blood plasma is a yellowish liquid component of blood that normally holds the blood cells in whole blood in suspension. In other words, it is the liquid part of the blood that carries cells and proteins throughout the body. It makes up about 55% of the body's total blood volume. It is the intravascular fluid part of extracellular fluid (all body fluid outside cells). It is mostly water (up to 95% by volume), and contains dissolved proteins (6–8%) (e.g. serum albumins, globulins, and fibrinogen), glucose, clotting factors, electrolytes (Na+, Ca2+, Mg2+, HCO3−, Cl−, etc. ), hormones, carbon dioxide (plasma being the main medium for excretory product transportation) and oxygen. It plays a vital role in an intravascular osmotic effect that keeps electrolyte concentration balanced and protects the body from infection and other blood disorders. The team regain control of the camp, and Tex re-establishes radio contact with Anchorage. Scott finally sends his story to a listening room full of reporters, beginning with a warning: "Watch the skies, everywhere. Keep looking. Keep watching the skies!" The Thing is a 1982 American science fiction horror film directed by John Carpenter and written by Bill Lancaster. Based on the 1938 John W. Campbell Jr. novella Who Goes There?, it tells the story of a group of American researchers in Antarctica who encounter the eponymous "Thing", a parasitic extraterrestrial life-form that assimilates, then imitates other organisms. The group is overcome by paranoia and conflict as they learn that they can no longer trust each other and that any one of them could be the Thing. The film stars Kurt Russell as the team's helicopter pilot, R.J. MacReady, and features A. Wilford Brimley, T. K. Carter, David Clennon, Keith David, Richard Dysart, Charles Hallahan, Peter Maloney, Richard Masur, Donald Moffat, Joel Polis, and Thomas Waites in supporting roles. 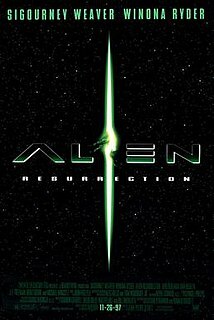 Alien Resurrection is a 1997 American science-fiction action horror film directed by Jean-Pierre Jeunet, written by Joss Whedon, and starring Sigourney Weaver and Winona Ryder. It is the fourth installment in the Alien film series, and the final installment in the original series. It was filmed at the 20th Century Fox studios in Los Angeles, California. George Watt Fenneman was an American radio and television announcer. Whitner Nutting Bissell was an American character actor. Kenneth Jesse Tobey was an American stage, film, and television actor, who performed in hundreds of productions during a career that spanned more than half a century, including his role as the star of the 1957-1960 Desilu Productions TV series Whirlybirds. Night Skies is an unproduced science fiction horror film that was in development in the late 1970s. Steven Spielberg conceived the idea after Close Encounters of the Third Kind. Instead, material developed at the time was used in Poltergeist and E.T. the Extra-Terrestrial. Robert Ray Cornthwaite was an American film and television character actor. The Naked Monster is a 2005 American ultra low-budget science fiction and horror comedy fan-film written by Ted Newsom and directed by Newsom and Wayne Berwick as an homage to and spoof of the "giant monster-on-the-loose" films of the 1950s. The final project took 21 years to make, and was both Kenneth Tobey's and John Agar's last film. Night of the Blood Beast is a 1958 American science-fiction horror film about a team of scientists who are stalked by an alien creature, which implants its embryos in an astronaut's body during a space flight. Produced by exploitation filmmaker Roger Corman and his brother Gene, it was one of the first films directed by Bernard L. Kowalski and was written by first-time screenwriter Martin Varno, who was 21 years old. It starred several actors who had regularly worked with Roger Corman, including Michael Emmet, Ed Nelson, Steve Dunlap, Georgianna Carter and Tyler McVey. The film was theatrically released in Dec., 1958 on a double bill with She Gods of Shark Reef. Howard Hawks (1896–1977) was an American film director who made 46 films between 1926 and 1970. He is responsible for classic films in genres ranging from film noir, screwball comedy, crime, science fiction and Western. The Thing is a 2011 science fiction horror film directed by Matthijs van Heijningen Jr., written by Eric Heisserer, and starring Mary Elizabeth Winstead, Joel Edgerton, Ulrich Thomsen, Adewale Akinnuoye-Agbaje, and Eric Christian Olsen. It is a prequel to the 1982 film of the same name by John Carpenter, which was an adaptation of the 1938 novella Who Goes There? by John W. Campbell. It tells the story of a team of Norwegian and American scientists who discover a parasitic alien buried deep in the ice of Antarctica, realizing too late that it is still alive. Creature with the Atom Brain is a 1955 American black-and-white zombie science fiction film from Columbia Pictures, produced by Sam Katzman, directed by Edward L. Cahn, that stars Richard Denning, Angela Stevens, S. John Launer, Michael Granger and Gregory Gaye. The screenplay was written by Curt Siodmak. My Life with Caroline is a 1941 American comedy film starring Ronald Colman and Anna Lee in a screenplay by John Van Druten and Arnold Belgard, and directed by Lewis Milestone for RKO Radio Pictures. It was Anna Lee's second Hollywood film and her debut in a Hollywood star role. Destination Inner Space is a 1966 science fiction film directed by Francis D. Lyon and written by Arthur C. Pierce. The film stars Scott Brady, Gary Merrill, Sheree North, and Wende Wagner, along with Mike Road, John Howard, William Thourbly, and Biff Elliot. The film was released in May 1966. ↑ "The Thing from Another World: Detail View." American Film Institute. Retrieved: May 19, 2014. ↑ "The Top Box Office Hits of 1951." Variety, January 2, 1952. 1 2 3 4 5 6 7 Warren 1982, pp. 151–163. ↑ Hamilton 2007, pp. 8–11. 1 2 3 4 5 6 7 Fuhrmann, Henry "A 'Thing' to His Credit." Los Angeles Times, May 25, 1997. Retrieved: April 20, 2012. ↑ Weaver 2003, p. 346. ↑ Carpenter, John (speaker). "Hidden Values: The Movies of the '50s." Turner Classic Movies , September 4, 2001. ↑ "Christian Nyby: About This Person." The New York Times . Retrieved: January 10, 2015. ↑ Mast 1982, p. 344. ↑ Matthews 1997, p. 14. ↑ Weaver 2003, p. 272. 1 2 Gebert 1996, p. 156. ↑ Crowther, Bosley. "The Screen: Two films have local premieres; 'The Thing', an eerie scientific number by Howard Hawks, opens at the Criterion." The New York Times, May 3, 1951. ↑ Willis 1985, p. 86. ↑ del Ray, Lester 1973, p. 4. ↑ "The Greatest Films of 1951." AMC Filmsite.org . Retrieved: May 23, 2010. ↑ "The Best Movies of 1951 by Rank ." Films101.com. Retrieved: May 23, 2010. ↑ "Most Popular Feature Films Released in 1951." IMDb.com . Retrieved: May 23, 2010. ↑ "'The Thing from Another World Movie Reviews, Pictures." Rotten Tomatoes , Retrieved: May 23, 2010. ↑ "Librarian of Congress Names 25 More Films to National Film Registry (press release)." Library of Congress. Retrieved: April 20, 2012. ↑ "National Film Registry." National Film Registry (National Film Preservation Board, Library of Congress). Retrieved: November 26, 2011. ↑ "1950s Sci-Fi Movies: Full List." Time , December 12, 2008. Retrieved: June 20, 2010. ↑ "1950s Sci-Fi Movies." Time , December 12, 2008. Retrieved: June 20, 2010. ↑ Booker 2010, p. 126. ↑ "AFI's 100 Years... 100 Thrills." American Film Institute|, Retrieved: March 7, 2012. ↑ Maçek III, J.C. "Building the Perfect Star Beast: The Antecedents of 'Alien'." PopMatters , November 21, 2012. Retrieved: January 10, 2015. ↑ Collura, Scott. "Exclusive: Moore Talks The Thing." movies.ign.com. Retrieved: January 10, 2015. Booker, M. Keith. Historical Dictionary of Science Fiction Cinema. Metuchen, New Jersey: Scarecrow Press, Inc., 2010. ISBN 978-0-8108-5570-0. Campbell, John W. and William F. Nolan. Who Goes There? The Novella That Formed The Basis Of 'The Thing'." Rocket Ride Books, 2009. ISBN 978-0-9823322-0-7.
del Ray, Lester. "The Three Careers of John W. Campbell", introduction to The Best of John W. Campbell 1973. ISBN 0-283-97856-2. "Doctor Who Classic Episode Guide – The Seeds of Doom – Details." BBC. Hamilton, John. The Golden Age and Beyond: The World of Science Fiction. Edina Minnesota: ABDO Publishing Company, 2007. ISBN 978-1-59679-989-9. Mast, Gerald. Howard Hawks: Storyteller. New York: Oxford University Press, 1982. ISBN 978-0-19503-091-4. Matthews, Melvin E. Jr. 1950s Science Fiction Films and 9/11: Hostile Aliens, Hollywood, and Today's News. New York: Algora Publishing, 1997. ISBN 978-0-87586-499-0. Warren, Bill. Keep Watching The Skies, Vol I: 1950–1957. Jefferson, North Carolina: McFarland & Company, 1982. ISBN 0-89950-032-3. Weaver, Tom. Eye on Science Fiction: 20 Interviews With Classic Sf and Horror Filmmakers. Jefferson, North Carolina: McFarland & Company, 2003. 0-7864-1657-2. Weaver, Tom. "Kenneth Tobey Interview." Double Feature Creature Attack. Jefferson, North Carolina: McFarland & Company, 2003. ISBN 978-0-78641-366-9.